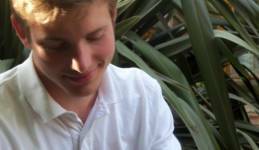 Max was an exceptionally talented young man from South London whose life was taken prematurely on the 28th June 2011. As a tribute to Max and in lieu of flowers his parents , Polly and Gerhard , would love you to make a donation in his memory to The Max Boomgaarden Cook Foundation. This foundation supports two local community organizations with which Max was very involved throughout his childhood and teenage years. These organizations are Whippersnappers and The Lambeth Cricket Academy. To make a donation and get more info. click here. Eternal love Max from your family. I was Max’s history teacher at The Charter School in year 12, and also his Director of Learing. He was a pleasure to teach, had a genuine interest in history, and loved the work we did on the Ruyssian Revolution and the Cold War. Max was immediatly likeable, settled into The Charter School really quickly and was such a fun loving happy person, able to have really mature conversations, and develop great rapport between himself and those he met. A real cheeky chappie, who will be sadly missed, not just by myself, but all the teachers at The Charter School who knew him, and the huge number of friends he made while he was here. Max has touched so many people’s hearts and we all miss him so much at Brockwell Lido. Many thanks to everyone who has donated to The Max Boomgarden Foundation. Sending lots of love to Polly, Gerhard, Leo and all Max’s family and his many many friends. We’ll always remember Max from his Sudbourne and Whippersnapper days. A mass of energy, a big smiler, and a total water baby at Brockwell Lido. He was a real Brixton boy, in the best sense. He’ll be much missed. Lots of love to all Max’s family and friends.